When my father was born, his mother Maria Voth died shortly after. In the book prepared by Ernest Klassen it shows my father's birthday as March 1, 1904, we always celebrated Dad's birthday March 15. His mother died April 12,1904. My grandfather remarried Anna Kroeker and they had 6 children. One died shortly after birth and one is recorded as having been taken in 1937. Around 1952 communications became possible with these relatives and my parents and your grandmother communicated with the remaining 4 children who remained in Russia. As a matter of fact they regularly sent parcels to Russia, first with used clothing, then later with new clothing as used was not allowed. I'll tell you what I know about the 4 children. Anna married Hans Wiebe. Hans somehow made it to Canada after the war without his family. He did not know if they were dead or alive and he remarried in Winnipeg Manitoba. Anna did come to Canada in the 1980's and saw her husband. I don't know any details of that visit, just know it happened. Anna died in Karaganda in 1982, just before the others moved to Germany. Johann had many children and they moved to Germany in 1987. His 3 daughters Irene, Hilda and Valentina came to Canada several times and stayed with my parents. I met them on these occasions. I stayed Valentina on this trip and she drove me around. Johann married Senda Gau. Senda now lives with Valentina and her family, she is suffering from dementia now. We went to visit Ira and her husband Hermann Isaak. They have many children and several are retarded. I met their eldest son this time and he speaks a little English, it seems to me he’s a truck driver. Ira has an interest in geneology and has put together quite a binder of pictures and history. She is my first cousin. We also visited Liesa who married Walter Fast. I’ve never met any of her children. She only has a couple of children. She is also my first cousin. Sara never married. She did move to Germany and died a few years ago. Married Johan Toews They had 3 children. Katja died in 1977. Her children are in Germany but just speak Russian. I’ve never met any of them. It seems to me that I heard that she gave up her children because she couldn’t feed them. Somehow there was a reunion though. Married Mietja Reger and had two children. She came to Canada in the early 1980’s and had a reunion with her brother and sisters, my father, your grandmother and Helen Neufeld. I picked her up at the airport in Toronto and drove her to Leamington. It was a very emotional time for all. Over the years I spoke to her on the phone and in 2007 went to Germany to see her again. We had a very nice visit and I met many of her grandchildren, her daughter Katja and husband Gustav Fenske and her daughter in law Vallie (her son Alfred died in Germany). She lived with her granddaughter Nina in Paderborn Germany. In about 2009 she had a stroke and was bed ridden until her death in January 2015. I visited her in 2010 but she couldn’t speak. I did have the sense that she knew who I was. In 2007 I stayed with Katja Fenske and met most of her children. Katja is my first cousin. I think she has 13 children. Her daughter Erna lives in Alberta and speaks very good English. Erna’s son came to Toronto this summer and came for dinner with us. Vallie is Russian and doesn’t speak English. 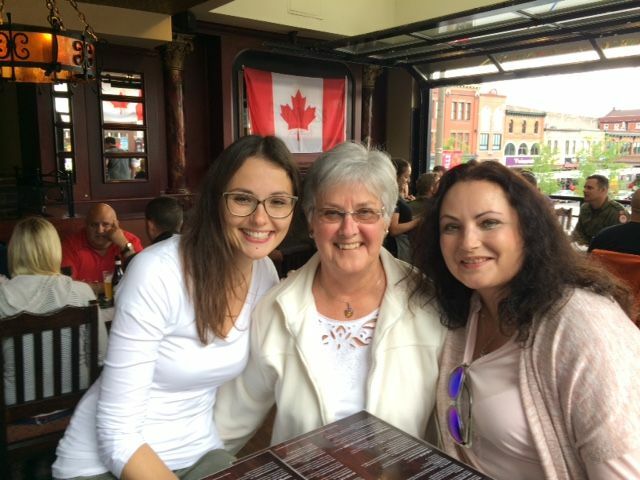 Liesa’s great granddaughter at some point wrote to us in Toronto and wanted to come to spend a year to learn English. We did some research and she wouldn’t be able to work legally so she never came, instead she went to England. We have stayed in touch over the years, her name is Eugenia and I met her this time. She works for Volkswagen in Wolfsburg and took us to see the spectacular show I talked about in my letter. She speaks several languages and is a very beautiful young lady. Her mother Nellie was Alfred’s daughter. So I’ve made 3 trips to Germany to spend time with these cousins. They were very special for my mother and father and they encouraged us to keep up the communication. I can get along speaking German, as can they, although their first language is Russian. They all lived in the labour camps in Siberia during the war and often didn’t have enough to eat. They are very grateful for the help they received from your grandmother, Helen Neufeld and my parents. When we look at pictures they tell me about the clothing and who it came from. They all moved to Germany during the 80’s and 90’s. My grandfather married a third time to a Helena Schellenberg. They had one daughter Agnes born in 1941. She married Harry Fleming and had 3 children. Mom and Dad met her when they visited Germany but she has died now. So this is my story about my German cousins. I have more marriage dates and birthdates if you want all that. There are many very big families. The children are learning English in school, but aren’t really comfortable speaking it, they would rather listen to my broken German. Liesa wrote some memoirs and a friend of mine translated it. I have maybe sent you that already but will attach it if I can find it. Haven't had time to research the request you got because I've been busy with two cousins who came from Germany, Eugenia and Nellie Reger. Nellie's Father Albert would have been your grandma Krause's nephew. We did Ottawa, 1000 Islands, Niagara, Toronto , Tobermory, Owen Sound, town of Eugenia and Midland in the past two weeks. Elisabeth (Liesa) Kornelsen, sister of Maria Mietz Kornelsen (married Krause), married Dietrich Johann Regehr (Mietja Reger) and they had two children: Katharina (Katja) Kornelsen (married Gustav Fenske) and Albert (or Alfred) Reger (married Vallie ?) who had a daughter Nellie Reger who had a daughter Eugenia Reger.